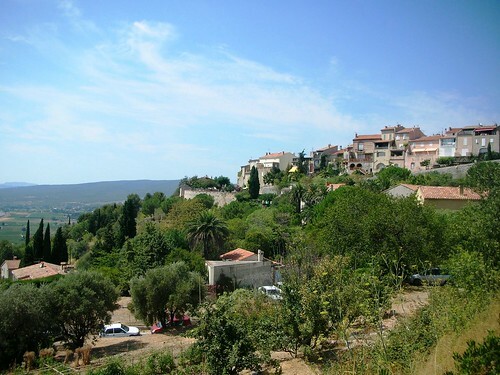 Le Castellet is a charming little village perched above the plains of the départements Var in Provence, France. Arriving on the little road from La Cadiére-d’Azur you get a good view of Le Castellet, as the road across the countryside and vineyards pretty much circles the village before finally climbing up to the center. It was a fortified medieval town, once belonging to the Baux and King René, ruled by the Lords and Bishops of Marseille and later by the Lords of Castillon. The “center” is at the top of the village, contrary to many Provencal villages where it’s on the slope and the top has only a lonely old church or castle. The narrow streets are cobblestone and the houses are old – nicely decorated with flowers. The chateau was last rebuilt in the 15th century, and has an imposing defensive feel about it. What a nice article about our visit to le Castellet! You did a very good choice for the diaporama! Yes, it’s right, I don’t know anyelse castle with the center at the top!!! I will immediately put a link on my last article! Anyone can’t miss it! We tried another Pancakes’restaurant in Sanary with the Captain and Mr lifecruiser but we prefered the restaurant Le Roi d’Ys in Le Castellet. Oh wonderful, Renny. You all have done so well telling us about the gathering. I feel that I was there! Ah, crêpes! My old time favorite of course, given that I’m from Brittany. My usual: salmon, cream and leeks. Yummy! I am very impressed with the crepe. The pancake part looks like lace. I would really like to know how to make that. I don’t even know what to call it. It’s just what I imagined Provence to be…just beautiful. Thanks for the tour of this beautiful place, Rennie. It looks like a charming place! I will never forget that day. Everyone running around wanting to see everything. I felt a bit like a ‘Japanese tourist’ taking so many pictures of everything imaginable. Thanks for sharing it with me the first time, and again now! great photos! glad both of you enjoyed your trip to france! Oh, yes, we had such a lovely time there! So much to see! Lovely photos of a lovely reality. Nice place for a blog gathering… so you speak French now ? you have been busy….what an amazing adventure and how exciting to be part of the this experience…. I really enjoyed looking at your pictures and reading about your blog gatherings .. I do not how to comment, in a neutral way. It was such a wonderful visit. Your ecellent photos tells the truth about the beauty of the Village and Provence nature. Both you and your lovely Diane has allready given us so many good memories from our short 8 days together. I’ve only come to the middle of France, to Lunch. Several days before we met in Marignan. Beautiful place. Odd said that Provence is France’s answer to Italy’s Tuscany. I am looking forward to take a trip there with Odd one day. Thanks for visiting my blog. I did not know that there were blog gathering like that, it must be nice. I started my blog last March and really enjoy meeting people from everywhere. I hope you’ll come back to my blog. great pictures, thank u so much for sharing them. That Crêpe looked delicious!! 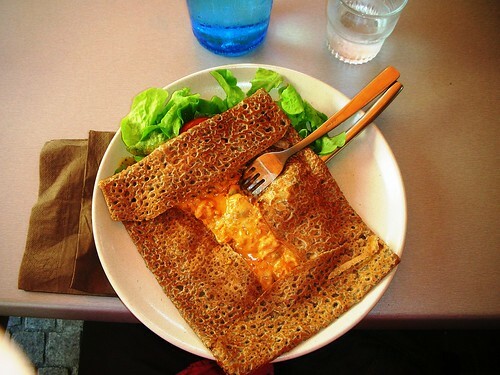 I love “des crêpes”! Castelle is absolutely beautiful! And I loved the photos, so thanks for sharing your delightful break with us :D! If you like this type of place, maybe one day you could try visiting Estremoz (in Alentejo, South of Portugal): it is also a town within the walls of a castle (that now is a very nice hotel). I wish you a great week, my friend…:D! how amazing! I want the food and the view! Renny this is just marvelous. I am so happy for you and your wife. I can only imagine how much fun this was. Oh that dish also looks so yummy!! I hope you keep on traveling my friend. We can all live vicariously through you!! Speaking of French I have a couple of things for you. Please forgive my misspell. I made the post before completing my first cup o coffee and left out the r in French. No rush, but, I did want you to know that I thought of you!! Wonderful pictures and post as always!! Hi,Thanks for sharing this nice post with a great info of related this nice post…. Thanks, and I do agree; An extraordinary beautiful area!